I’m very lucky to have a lot of friends and family that appreciate good food. It means I have lots of partners in crime when it comes to discovering a new favorite restaurant (Animal), plenty of people to co-sign on my newly developed $30-a-weekend cheese habit, and best of all, no shortage of friends to try out my creations. I was invited to a small gathering of some of these friends last weekend and, along with everyone else, was asked to prepare something for the meal. One of our friends is a vegetarian and that, along with the food’s portability, needed to be taken into consideration. Pizza and flatbread creations always come to mind in these situations. They’re great finger food, easily transported and straightforward enough that I could make two – one with the vegetarian in mind and one for everyone else. To be sure to keep it simple, I decided to use puff pastry as my crust and turn my attention to the toppings. Roasted vegetables seemed like the clear topping choice for a vegetarian. I decided to leave the selection of veggies open until I saw what looked good at the farmers' market. I don’t always like to do this because if I don’t have a focus, I tend to buy everything on site (as mentioned here), but looking for good veggies to roast seemed like enough direction. I settled on small red onions, petite carrots and brussels sprouts. If you can’t find these or don’t particularly like them, choose whatever vegetables you prefer to roast for the topping. Try to keep color in mind - the more vibrant the colors, the more appetizing your tart will look. The meat toppings were a cinch. Shredded chicken along with ridiculously thick cut bacon I picked up at Surfas matched perfectly with ricotta. I used fresh ricotta from Surfas, but if you’re feeling adventurous and want to make your own, you can find a recipe here. I’m a carnivore to end all carnivores (just check out the menu at my new favorite restaurant listed above), but I have to say the vegetarian tart was my favorite. 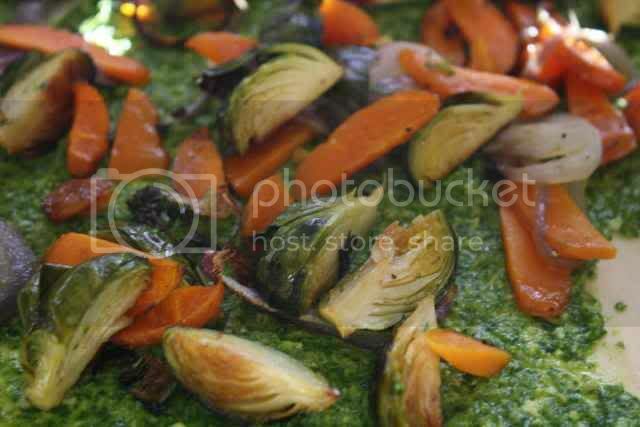 They were both delicious, but something about the way the roasted vegetables melded with the pea shoot pesto was really perfect. Score the puff pastry with a pairing knife to create a 1-inch border. Spread the pea shoot pesto inside the border and use a pastry brush to apply the egg wash to the 1-inch border area (as shown above). Spread the roasted vegetables over the pea shoot pesto and bake the tart for 20 minutes. Remove from the oven and sprinkle the Cabra Romero over the vegetables. Bake for 5 – 10 more minutes until the cheese is melted and the border is golden brown. Note – Cabra Romero is a hard Spanish goat cheese that is encased in rosemary. It’s faint note of herb is really delicious here, but if you prefer, a good parmesan would work as well. Score the puff pastry with a pairing knife to create a 1-inch border. 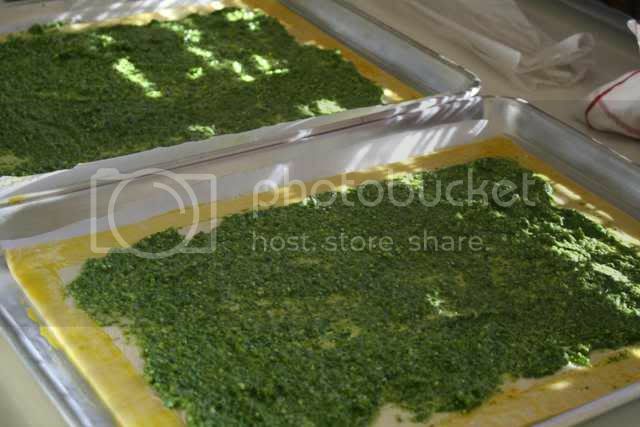 Spread the pea shoot pesto inside the border and use a pastry brush to apply the egg wash to the 1-inch border area. Shred the chicken breast. You may use the method of taking two forks and pulling the chicken apart, but I prefer my hands. Cut the bacon into lardons (slices about 1/4" wide) and fry in olive oil. When well-browned, drain on paper towels. Spread the chicken and bacon evenly over the pesto and top with chunks of ricotta. Bake for 25 minutes until the ricotta is just starting to brown on some edges. The crust on that pastry looks SO amazing! 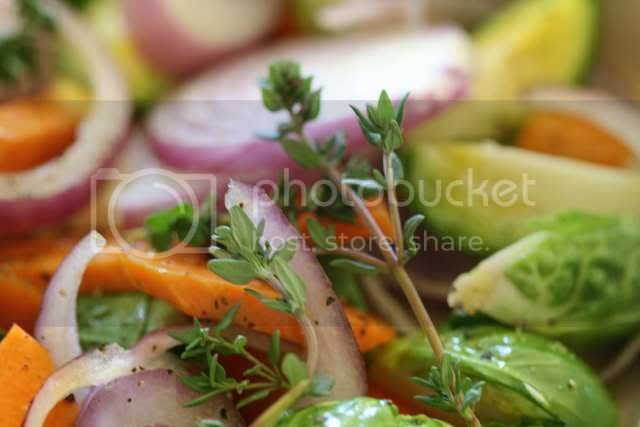 Although I love bacon, the roasted veggies do look so vibrant - especially the brussels sprouts. Yum! Pizza on puff pasty? I bet it was amazing! I'm a huge fan of roasted veggies as well! You cannot beat roasted brussels! Yum! Def book marking this for my next party! I'm not a vegetarian, but I think the veggie tart is my favorite too. This looks amazing! I'm sure it tastes great with all the orasted veg and your pesto! Um, bacon on puff pastry pizza? That sounds like the perfect party food, something that I wouldn't normally make for myself but would do for a party since everyone would love it. Those look so beautiful! You are so creative -- I love the idea of a pizza tart! I've heard wonderful things about Animal as well -- I am dying to try their bacon chocolate bar! I could eat a big pan of this!! It looks amazing! Those look perfect. I have to say, I'd be a fan of the meat one myself, but you can't go wrong with roasted veggies either! These look so good! I haven't worked with puff pastry much, but this makes me want to run out and buy some. What a delicious tart! So colorful! They both look tasty and perfect for partygoers. Nice work! Absolutely beautiful. Inspired my dinner option for this evening. I just love puff pastry. So simple and versatile! You have a really beautiful blog. This is my first time here but I will be back! This looks phenomenal! I can't wait to try all of your new recipes. It's been a couple of months since I've logged on and I always look forward to seeing what delicious recipes you've posted! Completely gorgeous! Puff pastry is one of those cool things that you can create some delicious things with pretty easily. Love it! 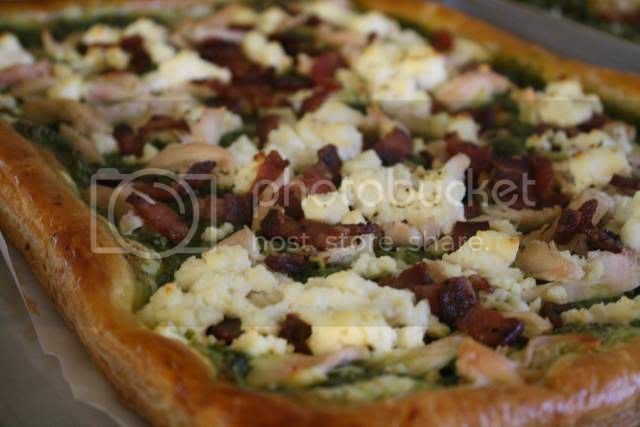 Excellent idea - I love the looks of that chicken and bacon tart - yum! That last one looks fantastic! love all the different veggies on top. i could see putting goat or feta on this as well but the ricotta prob. allows the veggies to really shine here. How beautiful! I'm know I'm late to the party, but I'm scrolling back looking through all your gorgeous posts! I'm so making this! Yum - looks like an easy starter for parties. I recently made a caramelised onion one and it was gorgeous - I love puff pastry!